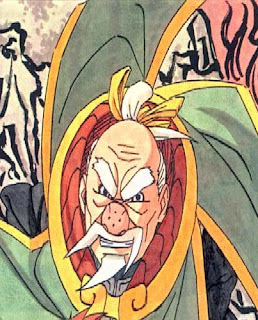 Onoki is the Third Tsuchikage (Sandaime Tsuchikage; Literally meaning "Third Earth Shadow"), and the leader of Iwagakure. He is called Onoki of Both Scales (Ryotenbin no Onoki). Onoki is very proud but appears frail, with constant complaints referring to his hips and back. He also refuses to retire and choose a successor as Tsuchikage despite his frailness, and insisting that he is plenty strong to continue to rule the village. According to his thinking of strategy, Onoki might be the type of person who takes risks. A similarity can be shown with Tsunade, as she has a habit of gambling and taking risks often. Remembering what Gaara said to him, he states to Akatsuchi and Kurotsuchi that he remembered what he really used to be before he became a stubborn old man, possibly meaning he had a more kind and friendly heart in his youth. 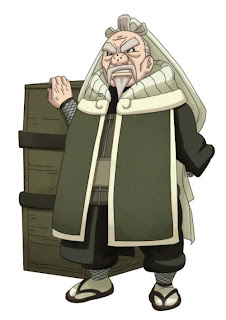 Onoki is an old man with a size of one and half times his head piece. His facial features include a triangular beard and a mustache with angular corners. He has a big red nose and thick eyebrows (similar to those of Rock Lee). The top of his head is completely bald, although, he has some hair at the back and sides of his head, the back of which is tied with a yellow ribbon into a ponytail. All of his hair (ponytail, sideburns, facial) is white. Despite being physically frail, he seems to be both knowledgeable and confident in his ninjutsu skills. Onoki's Dust Release ninjutsu allow him to pulverise his enemies to molecule-sized dust. He is also skilled with Earth Release ninjutsu and has shown the ability to levitate.